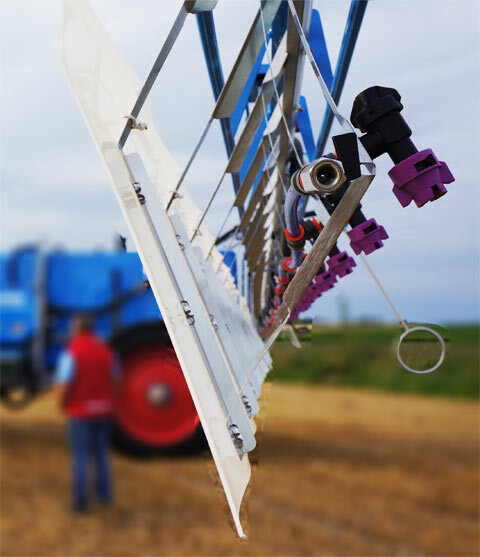 Cropsurfer™ , which will be mounted on the sprayer boom is manufactured of a stiff plastic sheet (A) and numerous of resilient parallelograms, on which the nozzle holder is attached to. The parallelogram are fitted with 33 cm distance between each other on the canvas. By the nozzle is angled obliquely backward, a uniform distribution is obtained even when the distance is short between the nozzle and target. The different parallelogram moves individually at runtime depending on load. During movement keeps the nozzle angle and the distance to the target surface, which gives a good distribution uniformity. The force acting on the screen while driving reduces the boom swings in height and direction.